Are you working to reduce the number of individuals experiencing homelessness in your community every month? How can you tell if all the hard work to build systems, improve processes, and expand resources are adding up to a reduction in homelessness in your community? Here’s the bottom line - if you don’t know how many people are experiencing homelessness in your community right now and how this is changing month over month, you don’t know if you’re ending homelessness. One of the key findings from the 100,000 Homes Campaign and Built for Zero, national efforts to end homelessness in communities across the nation, is that regularly tracking system performance drives improved outcomes. 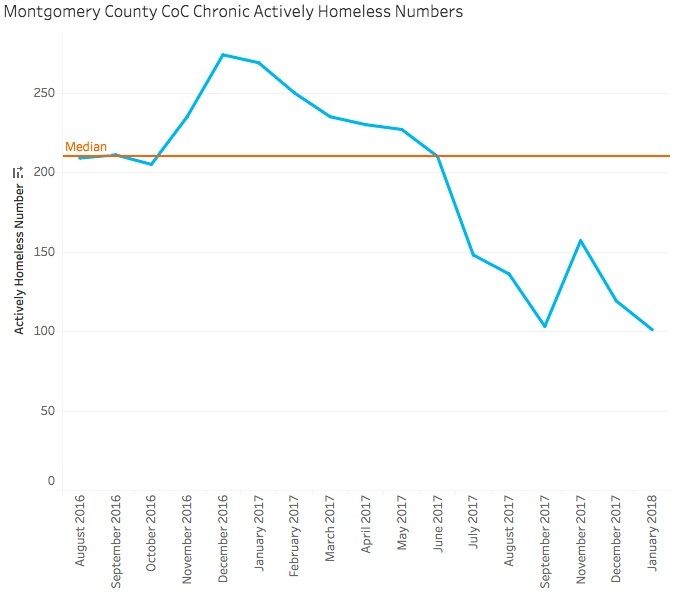 And yet, around the country we often find that communities are not tracking the number of people actively experiencing homelessness more than once a year. From our work with over 70 communities, we have seen that the best indicators of success in reaching functional zero—Built for Zero’s definition of success—are a community’s ability to a) achieve a real-time, by-name list that is both comprehensive and reliable, b) observe and interpret fluctuations in the list as measures of whether homelessness is rising or falling at any given time, and c) quickly test and iterate on ideas to drive reductions in the numbers of people experiencing homelessness. Today, we are working with the first communities in the country who can show, measurably and with reliable data, that they are achieving monthly reductions in the number of people who are actively experiencing homelessness. 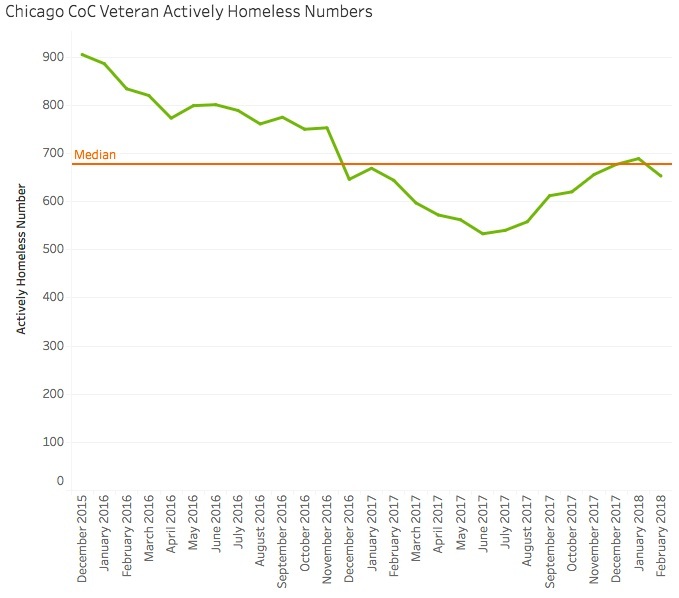 Montgomery County, MD, and Chicago and Rockford, IL, are examples of three communities that have tracked measurable decreases in their numbers of Veterans and/or those experiencing chronic homelessness. The data you see below is part of a data and performance management infrastructure built on a Tableau platform that is used by Built for Zero communities. Through this dashboard, communities can monitor the fluctuations in their active list—along with their inflow and outflow data—and respond at the systems-level as changes are happening. 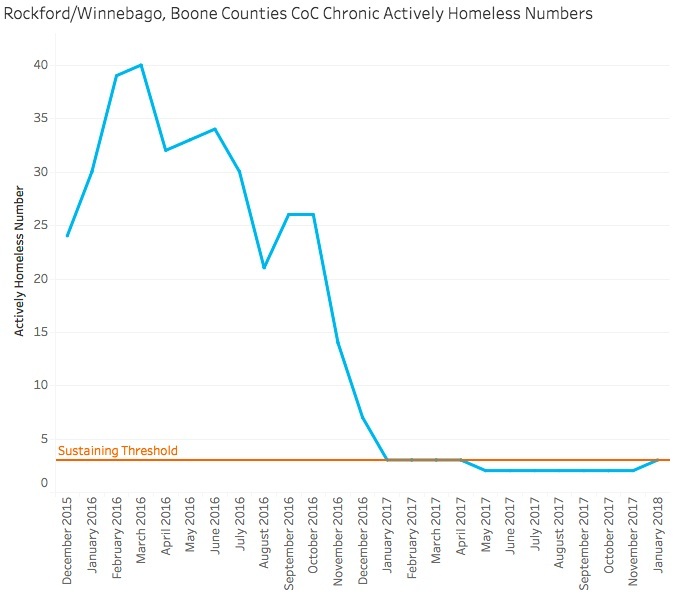 Here are three more reasons why tracking your actively homeless numbers month over month (even week over week if you can!) is an essential priority and a critical step toward ending homelessness. 2. With real-time data, you can confidently advocate for the resources you need to end homelessness. Any fund raiser worth their salt will tell you that a quantified and specific request for resources, tied to data-informed logic about how those resources will result in an outcome, puts you in the best position to get what you need. Around the country, we’re starting to see new resources emerge from the private and public sectors in an effort to fill critical housing and service gaps in communities. If this trend continues to grow, having real-time data to quantify what it will take to reduce and ultimately end homelessness will be a powerful tool to make big requests. 3. Real-time data helps keep your stakeholders mobilized and focused on the goal. We’ve seen that even in communities where the number of people actively experiencing homelessness is going up, having a clear and real-time sense of progress provides focus and energy to community stakeholders working to reverse the trend. Shared data enables shared work toward shared aims! If you want to learn more about how to track the number of people actively experiencing homelessness in your community reliably in real time, or want to share thoughts or questions, we’d love to hear from you. You can contact us at nfrench@community.solutions. Community Solutions deploys problem-solving tools from multiple sectors to help communities end homelessness and the conditions that create it. Coordinated by Community Solutions, Built for Zero is a rigorous national change effort designed to help a core group of committed U.S. communities end Veteran homelessness, chronic homelessness, and homelessness for all.